Loxahatchee, FL – May 18, 2010 – Vinceremos Therapeutic Riding Center (VTRC) is currently preparing to participate in the Special Olympic State Equestrian Games, which will be held May 21-22, 2010, in Tampa, Florida. Sixteen riders qualified for the Games after competing at the Area level March 27, 2010, in Ft. Pierce, FL. 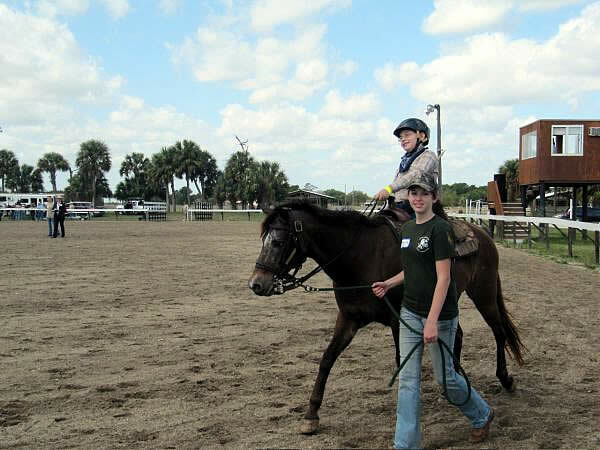 During the Special Olympic State Equestrian Games riders will have the opportunity to compete in English and western equitation, trail ride competition, dressage, and pole bending. The riders representing VTRC range from needing full support with a leader and two sidewalks to independent riders who walk, trot, and canter on their own. They also have several riders competing in the training level dressage tests. The qualified riders have been working on dressage test, equitation skills, pole bending, and barrel racing to prepare for the exciting competition. In addition to the 12 students traveling to the Games, six horses and 17 volunteers will be in Tampa for the event to support VTRC. Sinead Halpin and Samantha Lendl from PRO tell us about some new initiatives and Jersey Fresh Course Designer, John Williams, joins us with a review of this year’s event plus some other news. Take a listen. News: Jennie and Doug continued to entertain by participating in an exhibition game with the Bucks County Polocrosse Team and you can see some photos of their antics on the Chronicle of the Horse website. If your horse’s shoulders are stuck, it’s like having a kink in a water hose. The energy can’t flow from behind, over the back, into your hands where it can then be recycled back to the hind legs. Here are two shoulder suppling exercises for you to try with your stiff horse. 1. Make a 20-meter box with 4 corners in the walk. If you’re going to the left, ask for right counter flexion with your right wrist. Stay in counter flexion during the entire exercise. 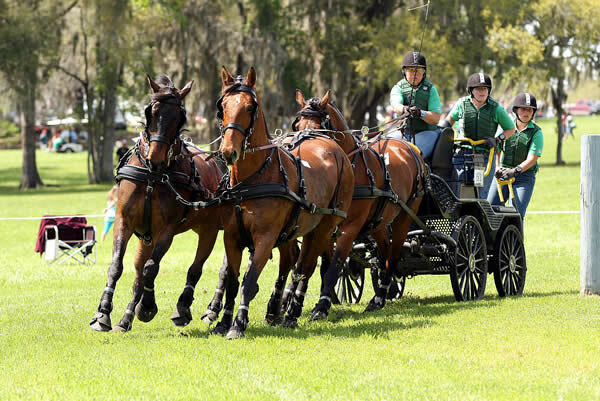 At the first corner, bring both hands to the left to swivel your horse’s shoulders around the corner. Then, soften the contact without letting the reins get loopy. After the corner, walk straight ahead in counter-flexion. At the next corner, bring both hands to the left again. Do this in all four corners. As your horse’s shoulders become more supple, it’ll get easier to spin his shoulders around the turn without meeting resistance. You can tell there’s no resistance when the weight in your hands stays the same as you swivel your horse’s shoulders around the corner. 2. Ride down the long side of the ring, and move your horse’s shoulders slightly to the left and right. Walk down the long side of arena. Flex your horse at the poll opposite the direction you’ll be moving his shoulders. For example, when riding to the left, ask for a counter flexion to the right by turning your right wrist. Then, take both hands to left to slide your horse’s shoulders over. Move the shoulders over only 1-2 inches. Now change to correct flexion by turning your left wrist. Move both arms to the right to pop the shoulders back out to the track. Smoothly and fluidly move the shoulders back and forth as you work your way down the long side. 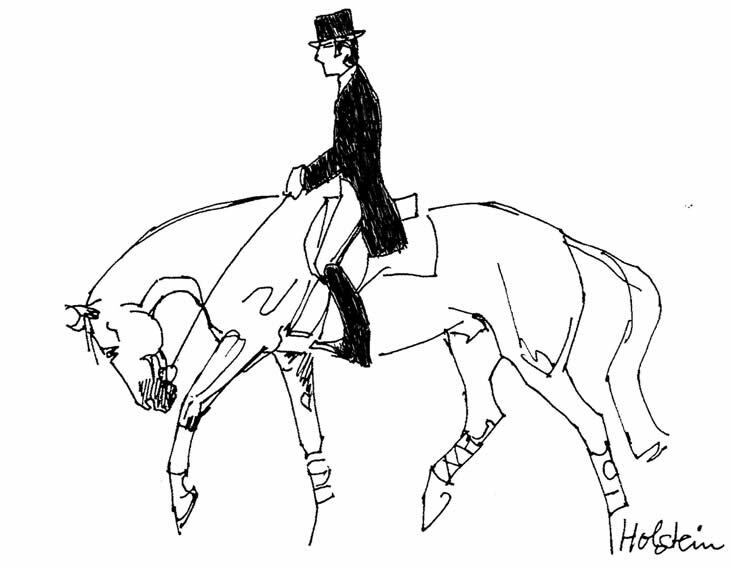 11 May 2010 – The new Annex (XIII) created by the Working Group that produced a revised FEI Stewards Manual on warm-up techniques for Dressage has now been completed, following the production of three diagrams to illustrate permitted positions of the horse’s head and neck during pre- and post-competition training. 12 May 2010 – British-based riders have their first chance to earn points in the valuable HSBC FEI World Cup Eventing series at Chatsworth (GBR) this weekend (May 15-16), and five nations are represented in the entry of 33. Paul Tapner (AUS), fresh from his thrilling Badminton success, is two-handed with Kilfinnie ll and Tiger Flynne, and is joined by fellow Australians Bill Levett with Sea Oro and Sam Griffiths, having his first major international competition this year with Happy Times, third at Badminton and Burghley last year. The Chatsworth CIC***-W has often proved a pointer to future international success, and Clayton Fredericks (AUS), who won this class in 2006 on Ben Along Time, is riding his smart new acquisition Bendigo lll, a German-bred horse proven in Grand Prix Dressage and Jumping which has been taking the national season by storm. 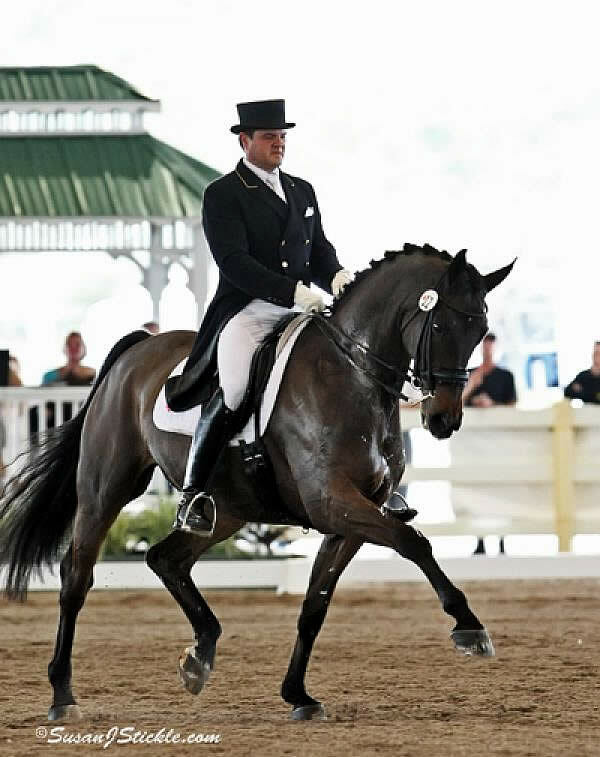 Wellington, FL – May 10, 2010 – Based in Coatesville, PA, and Wellington, FL, Todd Flettrich has had a successful dressage career and is well on his way to qualifying for this year’s Alltech FEI World Equestrian Games (WEG). Anne Gribbons, a renowned rider and trainer who has known Flettrich since the start of his career, has watched Flettrich as a young rider, has competed with him and against him, and has judged him in competition for years. Now the United States Dressage Team Chef D’Equipe, Gribbons watched Flettrich and his Grand Prix mount Otto very closely this season and thinks that it looks promising for the talented duo to qualify for the U.S. Team that will compete at the WEG in the fall. Six-time Olympic Dressage rider Robert Dover spoke at a recent “Shop Talk” at Sho Clothes dressage boutique in Wellington. Dover is the new coach for the Canadian Dressage Team. 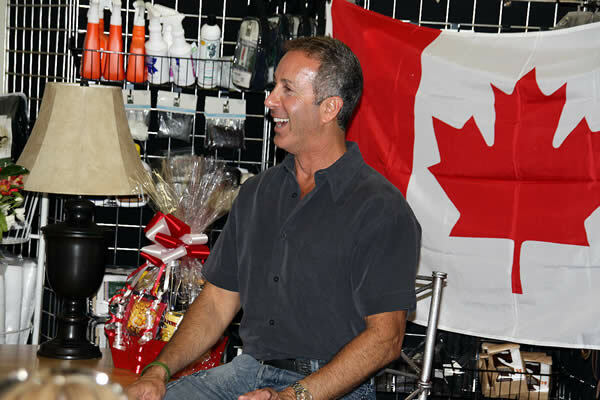 Wellington, FL (May 10, 2010) – It was standing room only at Sho Clothes dressage boutique’s recent “Shop Talk,” thanks to an energetic crowd eager to hear six-time Olympic Dressage rider Robert Dover speak. Dover, the new coach for the Canadian Dressage team, has earned more honors than any other US Dressage rider, competing in six consecutive Olympics as well as representing the United States in four World Championships and seven World Cups. Dover, who served as the Captain for the US Equestrian Team during all six of his Olympic experiences, charmed the audience during “Shop Talk.” The monthly get together for equestrians is presented by Sho Clothes at their Wellington boutique in association with the Gold Coast Dressage Association. “This was our final ‘Shop Talk’ until the fall and having Robert speak was a great way to end our season. In addition to being one of the best dressage riders of our generation, Robert is a wonderful speaker and it was a treat for everyone,” said Betsy Rebar Sell, who co-owns Sho Clothes with Michele Hundt.